Get the care you want today. Be prepared for unexpected healthcare needs, and use it for everyday beauty needs. The CareCredit credit card helps make it easier to take care of everyone in the family- including your pets- for health, wellness and beauty needs. The CareCredit credit card gived you options you can’t typically get with other credit cards such as financing options. 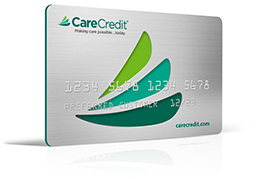 Visit carecredit.com for information on receiving CareCredit benefits. Kulp Nutrition and Wellness is proud to accept the CareCredit credit card for your nutrition needs! Feel free to call the office for more information about accepting CareCredit.